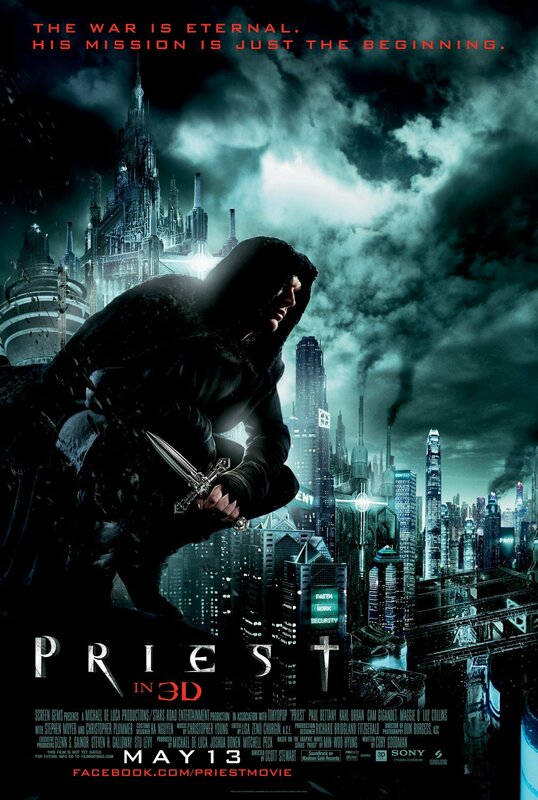 Priest is Scott Stewart‘s adaptation of Min-Woo Hyung‘s graphic novel, written by Cory Goodman and starring Paul Bettany, Maggie Q, Karl Urban, Cam Gigandet, Lily Collins, Stephen Moyer, Brad Dourif and Christopher Plummer. As long as anybody can remember, humans and vampires have been battling each other. And the vampires seemed to be winning – until the Priests came along, a specially trained task force sent by the church. They managed to relegate the vampires to reservations and a kind of peace has settled over the war-destroyed world. But then a small town on the outskirts is overrun by vampires and the young Lucy (Lily Collins) is abducted. Lucy’s boyfriend Hicks (Cam Gigandet) calls on her uncle for help – a Priest (Paul Bettany). Together they go after the vampires. Priest is everything it promises to be: full of oneliners that are instant classics, hammy performances and plot and characters from the stereotype shelf. In short, it’s absolutely craptastic. The only thing that was really unentertaining about it was the lack of naked Paul Bettany: he only got to undress once and then only for a couple of moments. Not okay.